It is finally time that our well-served FirstView Manager will give way to a new, better interface. The new content management system has been tested and refined throughout the year. During the pilot phase, we received valuable feedback from our customers, which made the interface even better. In assessing usability, there is no better expert than the end-users, so we owe a big thank you to our customers. Now the new, enhanced MediaCloud CMS is ready for release and available to our customers in October 2018. Why was the new interface needed? The number of FirstView displays is constantly increasing. Our mission is that FirstView will continue to stand out with ease of use. The current user interface has been developed for over a decade, always introducing new functions. However, some ideas have proved difficult to achieve simply because of built-in constraints of the old system. In this respect, it was clear that the old interface had come to an end. Our R & D team has not spared time or energy thinking about how the system would be as clear as possible but would still cater to versatile user needs. 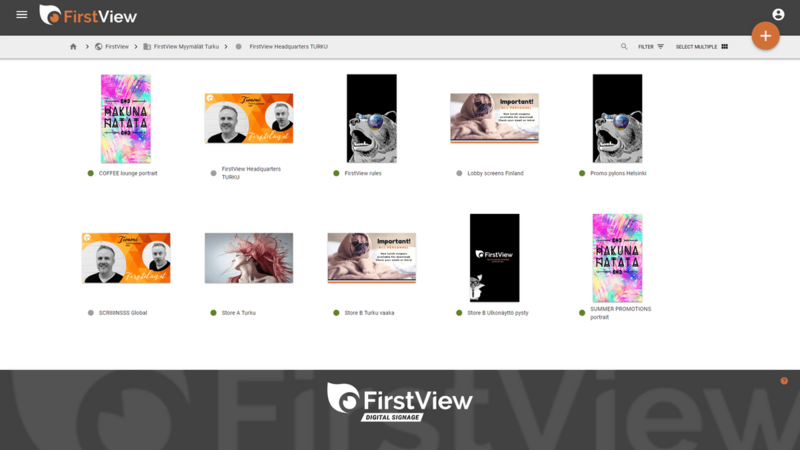 The new interface is a great leap in user-friendliness, which is why we at FirstView are thrilled with the new MediaCloud CMS. This update brings numerous improvements, but what is going to change in practice? During the summer we completed a full revamp of our website and company image. Naturally the most visible update of the new MediaCloud CMS is its fresh, clean look. The new interface has been streamlined to ensure that even new users can easily manage content. The unified, renewed look is aligned with FirstView’s working principle: clear, high quality and relaxed. Digital signage screen is nothing without content. In new MediaCloud CMS, content management is made even easier: content can be added directly on the main page without navigating to zones or display groups. At the same time, finding and using templates is easier than before. While content is easier to add, the preview function has also been improved. New preview mode shows playlist content as a whole and in correct aspect ratio. In the new user interface, a lot of effort has gone into making the interface intuitive with clean look and clearly visible buttons. This makes it easier to use all important features without having to resort to user manuals or training. Managing content on a mobile device is becoming increasingly common. The new MediaCloud CMS responds to this need. The user interface has been specially designed for mobile use, without forgetting other devices. On a larger screen, more features are visible while the mobile view is kept simple and buttons clear. For users who control multiple zones and media players, the new interface is an upgrade that has been needed for a long time. In the new MediaCloud, users can manage multiple zones in one view. This also applies to viewing all the content of a media player. At the same time, previous display groups become more versatile playlists, which can be shared to different zones. Search features expand to slides and media players. In the new interface, it is even easier to look up existing templates and media players. At the same time, the search function offers shortcuts: for example templates can be directly used to create new content. In the new interface, splitting displays into zones applies to one media player only and not a whole display group. Splitting displays by the display group sometimes caused problems when one display was part of several display groups and display zones were all different. Splitting displays into zones is done using a similar tool than in the old UI. Old content from split displays will be moved to their own playlists, which are linked to a specific display zone. Although a lot of effort has been made and our long-awaited user interface is now being released, its development will not stop. The new interface is entirely developed and designed by our team at FirstView. We aim to make our service even better and the new interface is a good starting point. Right after publishing, we continue developing better user management, a new content editor and enhanced media library. Usability in a new interface is hardly ever perfect at once. We kindly ask our users to share their experience with us and give direct feedback at info@firstview.fi. You can also give feedback directly in the new MediaCloud: simply click the user icon and you will find a link for feedback.